Bishop Angaelos, General Bishop of the Coptic Orthodox Church in the UK, who is one of the co-chairs of the Lausanne-Orthodox Initiative (LOI) was given the prestigious Coventry Cross of Nails at Coventry Cathedral, UK, during the Easter Sunday service last month. The Coventry Cross of Nails is recognised throughout the world as a symbol of peace and reconciliation. Although it has been awarded to hundreds of charities and organisations over many years, it is only rarely presented to individuals. It is identical to the cross regularly worn by the Bishop of Coventry, the Dean and Canons of Coventry Cathedral, the Bishop of Warwick and the Archbishop of Canterbury. The gift of this cross is in recognition of Bishop Angaelos’ extensive advocacy work and his particular focus on dialogue, conflict-resolution, and reconciliation. ‘It will be a great joy to welcome Bishop Angaelos to Coventry Cathedral as our Easter Day preacher. I’m thrilled that he will become a bearer of the Coventry Cross of Nails. I know that the Coventry story means a great deal to Bishop Angaelos and I am sure that it will be an aid to his own remarkable efforts to speak words of speak and to encourage words of reconciliation in a world of violence where the innocent, including vulnerable minorities, are victims of terrible cruelty’. As the Russian Orthodox Church continues to develop its mission work and the establishment of the Orthodox Church in the Philippines, a meeting of those involved was held in Moscow on 24 March 2016. The working group for organizing, coordinating and supporting the Russian Orthodox Church’s missionary work in the Philippines met for its second session at the Moscow Patriarchate’s department for external church relations (DECR). The working group has been established by His Holiness Patriarch Kirill of Moscow and All Russia. A full report can be seen here. At a ceremony hosted by Lambeth Palace in London yesterday the Lambeth Cross for Ecumenism was awarded by Archbishop Justin Welby to three leading ecumenists. Amongst the three was the co-chair of the Lausanne-Orthodox Initiative, His Grace Bishop Angaelos, General Bishop of the Coptic Orthodox Church in the United Kingdom. 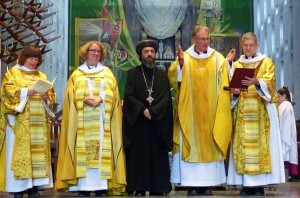 The other two recipients of the Lambeth Cross were His Eminence Archbishop Gregorios (left) of the Greek Orthodox diocese of Thyateira and Great Britain and Revd. Canon Simon Stephens (right) who was for some years the Anglican chaplain in Moscow where he worked closely with the Russian Orthodox Church. “Awarded to His Grace Bishop Angaelos, General Bishop of the Coptic Orthodox Church in the United Kingdom, for his contributions to ecumenical and interfaith engagement and his tireless commitment to peace and reconciliation. “Under the leadership of His Grace Bishop Angaelos, the Coptic community has become an active and valued presence in UK society. In establishing the Coptic Centre in Stevenage, Bishop Angaelos has provided for the community at large a vibrant hub for ecumenical and interfaith engagement. As a friend of the Church of England he has actively fostered deeper understanding and collaboration between our two churches. He played a key part in the resumption of the Anglican Oriental Orthodox International Commission after a break of ten years. 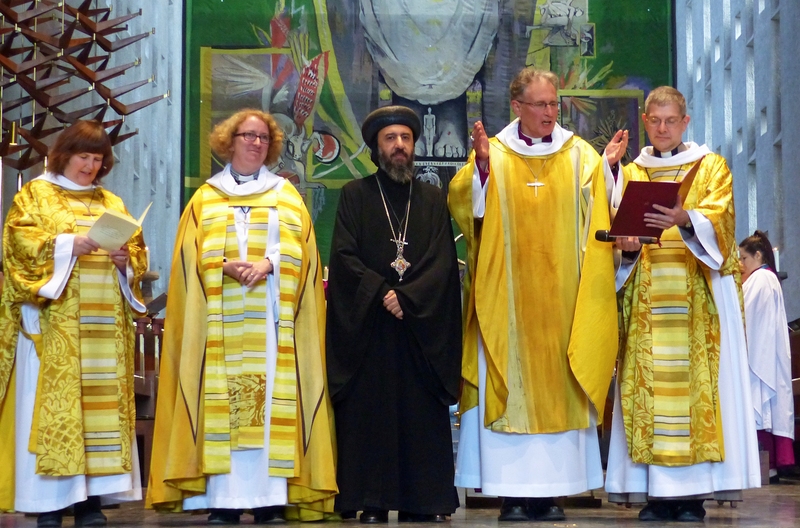 “Bishop Angaelos has been a powerful advocate for peace and reconciliation. His public interventions concerning the political instability in Egypt and the Middle East, for example, sounded a reasonable and conciliatory tone, spoken from personal integrity and experience. “He addressed the General Synod of the Church of England in July 2013, calling for pragmatic and intentional leadership in Egypt and for national reconciliation. At his request a meeting of solidarity and a service of prayer for Christians in the Middle East under the theme ‘rejoicing in their faith and sharing in their collective pain’ was held at Lambeth Palace and hosted by the Archbishop of Canterbury. This was one of the earliest such initiatives attended by church leaders and community representatives in the UK.